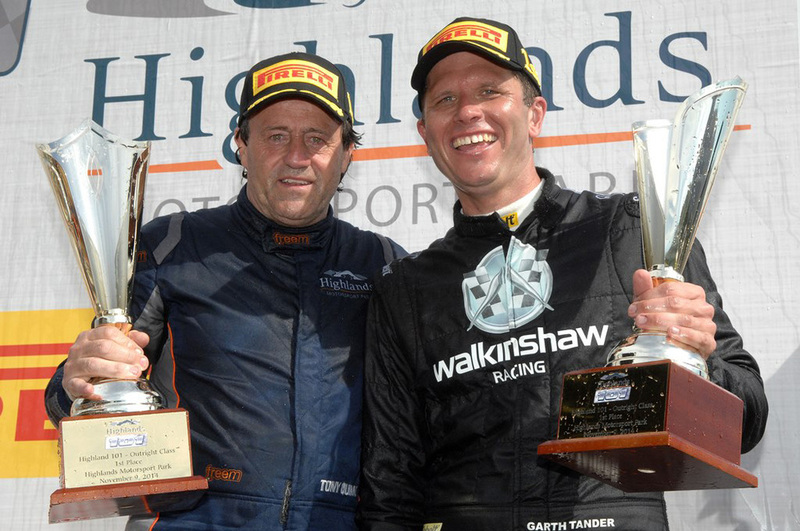 Tony Quinn achieved one of the objectives he'd set himself for last weekend's Highlands 101 race meeting when he and Garth Tander won the endurance race at Highlands Motorsport Park in dramatic fashion. As Quinn told us prior to the November 7–9 event he had his sights set on both the Highlands 101 race win and the Australian GT Championship title, and while he failed to eclipse Richard Muscat in the race to the Championship, a last-minute turn of luck saw him come up trumps on track. The pair were coming second right up until the very last lap, following behind Richard Muscat and Craig Baird's Mercedes-Benz, which had been in the lead for more than 90 laps of the 101-lap race. The Mercedes-Benz ran out of fuel only a few metres from the finish line meaning Quinn and Tander could pass them into first place. During the 101 laps, Tander managed to break the Australian GT class lap record three times giving him a new lap record of one minute and 31.716 seconds. The same Aston Martin Vantage GT3 was used that Quinn previously won the inaugural Highlands 101 last year, with Fabian Coulthard, as well as taking out the Phillips Island 101 earlier this year with Tander. The weekend's win marks a record-making three-peat of 101 race wins in Australian GT racing.